We are all constantly searching for ways to learn, to study, to pick up new words, and become better at our preferred language. Everyone can learn a new language, it is just a matter of time and effort. What is even better is that with changing our habits we can build up a whole new language! Everyone has 15 minutes of “down time” in their day. Waiting for the bus, commuting, lunchtime, before going to bed – you name it! Over a year, these daily 15 minutes add up to more than 90 hours. If that time was used to learn 10 new words a day, maybe even writing them out on flashcards, in a course of a year that would add up to 3600+ new words, which is already a basis of a language. Use the menu below to navigate to the different sections. You can always come back to the beginning by clicking on the arrow on the bottom right side. Why Learn Spanish with Dictionaries? 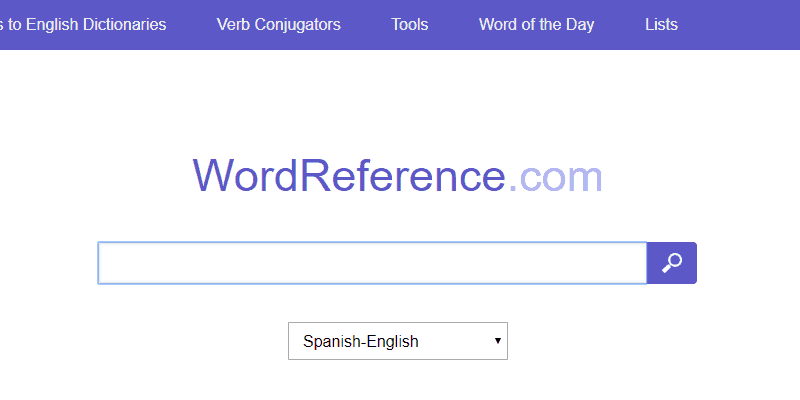 Are All English-Spanish Dictionaries Equal? What Digital Dictionaries Are There? Despite numerous and more modern methods of learning a language, dictionaries are still highly regarded. With tools like websites, apps, podcasts, and such, one would think that the good, old dictionary has been long outdated. Whether it’s Spanish, English, or any other language – with these proven lifesavers, unfamiliar words can be understood in just an instant. Some time ago, the huge tomes in our closets underwent a transformation and became quickly accessible websites and sleek apps for our smartphones. 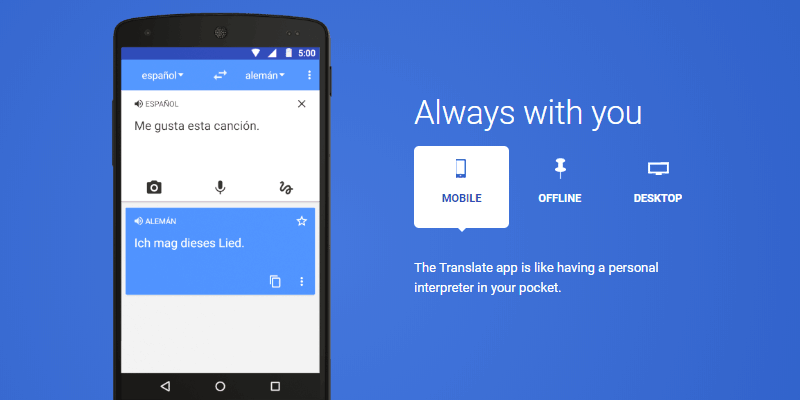 Translating from English to Spanish has never been this easy! To assist you, we have scrutinized the large family of dictionaries now available so that you know how to make the best use of them while learning Spanish. In the classroom, for example. Despite “Generation Smartphone,” there’s no way around the printed version, especially for exams. When traveling to countries with another language, dictionaries are valued companions, too. The favorites normally being Spanish dictionaries that already include a few everyday phrases. Recently, so-called slang dictionaries, such as ”Spanish for insider” or “Gibberish, Spanish slang” are becoming increasingly popular. With them, you are able to learn how a local would express himself in colloquial tongue through the use of vivid examples. Additionally, these dictionaries tell you what terms are especially common in certain situations. Admittedly, these books also contain all sorts of vulgarities and obscenities, but maybe that’s part of their charm? 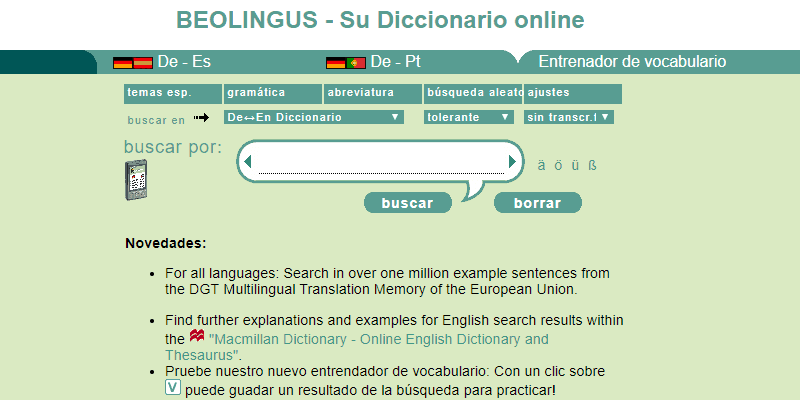 Truly irreplaceable are Spanish Dictionaries in their online versions. Whether for research on the Internet, reading Spanish books, or making travel arrangements, they provide us with quick answers. Definitely not! But before we closely examine the qualitative differences of various suppliers, let’s have a general look at the dictionary genres. What is the difference between a monolingual and bilingual dictionary? Monolingual dictionaries rewrite a word and thus helps you to understand it’s meaning without a translation. This type of reference book is frequently allowed in exams. A very important monolingual dictionary is the “Real Academica Española” (Royal Spanish Academy) which is widely known as the “RAE“. It offers a very comprehensive Spanish-Spanish vocabulary, that is also equipped with many sample sentences. Those who do not have the hardback edition to hand, can also use the online version. Multilingual dictionaries, however, translate a word in two directions – from one source language to another, and vice versa. They embody the typical dictionary. Spanish to English or English to Spanish are examples of possible directions of translation. These resources prove to be especially loyal friends on holidays, but they can be a good source of help when reading texts in other languages, too. Is there a difference between online and printed dictionaries? Due to technological advancement in recent decades, there has been yet another type of dictionaries to choose from. Namely, between printed and digital. A printed reference is understood to be a traditional hard copy Spanish dictionary. Whether for English, Spanish or German, almost everyone has a copy of this type of dictionary in their bookcases at home. These dictionaries, as the name suggests, are online. Not only do they spare us from endlessly scrolling between countless sites, but they also save us a lot of bookcase space. In addition, they are also considerably lighter and more manageable. It is much easier for travelling than their printed relatives. Yes, we all know this one. And how many of us have been saved from awkward situations at least once because of it? If we are missing the vocabulary necessary to express ourselves adequately, this option provides much needed aid. 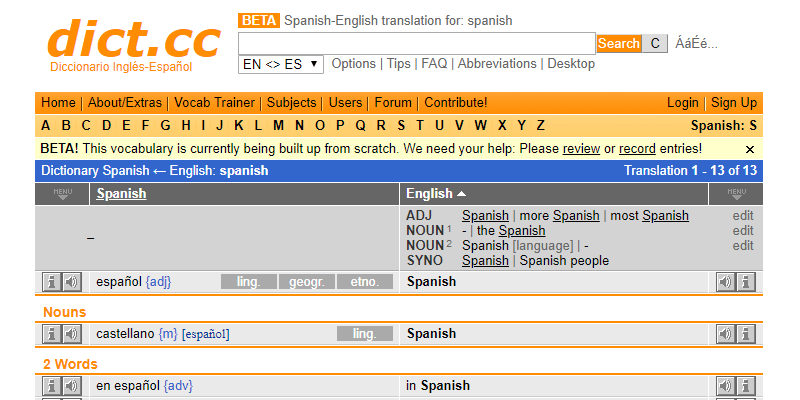 One cheer for the online Spanish dictionary! The savior of forgotten vocabulary rushes to the rescue as a book, website or app. But how do we learn Spanish online? Which Spanish-English dictionary is the best to use? Choosing the best dictionaries out of the countless ones that are now being offered to us through the internet, is not always an easy task. And as we all know, the first search result is not always the best source. So that you know what to trust, we have vetted different providers for you. Before delving into that however, let us briefly discuss two further digital types. Practical and easy – and above all, they are always with you! Nowadays, we barely leave the house without a smartphone or tablet. This probably makes the Spanish dictionary app the most commonly-used translator in present-day circumstances. Especially handy are those apps which can be used offline. 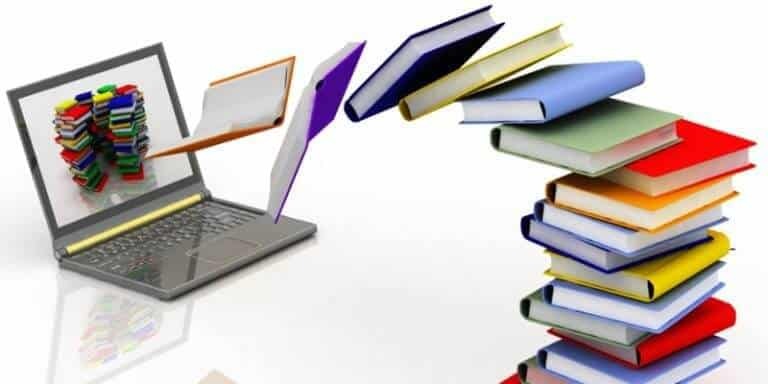 This means that they allow us to download all required vocabulary onto our devices, thereby allowing us to use it without connection to the web. More information about those can be found in our great dictionary comparison below. Ever heard of one of these? No? If not, don’t worry! 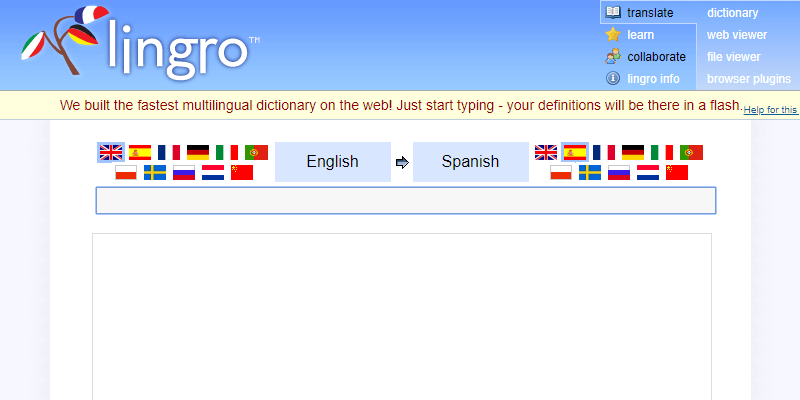 Admittedly, the electronic Spanish dictionary is not one of the most common forms of digital dictionaries in use today. An electronic dictionary is defined as a hand-sized mini computer with software consisting only of a translation program. So that’s basically all it does. Given the competition of apps and similar technologies these days, it is easy to see why it has no real relevance in the modern day market. Last, but not least, we want to check out the digital services’ capability. One last word concerning printed dictionaries though – despite thorough research, we were unable to come up with just one recommendation of which dictionary to buy. Printed dictionaries vary greatly with brand, scope and accuracy. At the same time, there are similar features such as a phonetic script which can be found in any dictionary. So, in the end, it always depends on what you expect from the dictionary – do you prefer a large or small vocabulary? 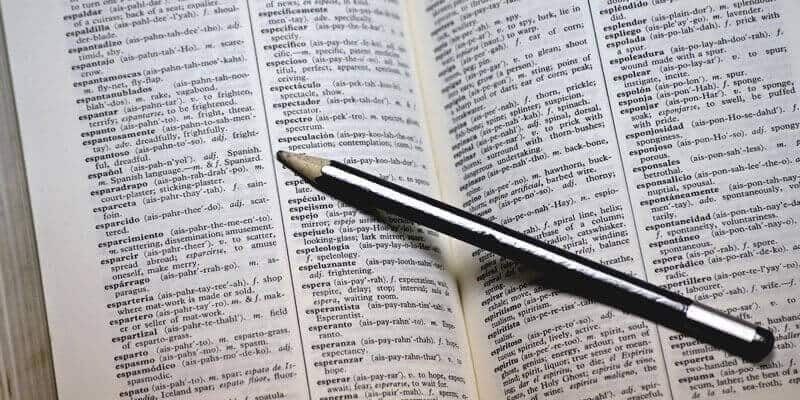 Do you need the dictionary for use while traveling or do you prefer a standard version? Do you need one that’s related to your profession or one that contains slang words? Our recommendation is that you take a close look at what the purpose of this dictionary is supposed to be. You can then conduct a search based on this, and select the one that suits you the best. To translate English to Spanish can be quite tricky. So to help you to find the best options out there for you, we researched all the specifics on the prime services. This is not exactly a classic dictionary. As its name suggests, it’s a translator, but since it provides us with results when entering a word in Chrome for translation, we want to briefly mention it here among the online dictionaries. As it currently covers as many as 90 languages, it’s certainly the most extensive free “dictionary” available online for now. With this Translator, Spanish to English translation can be just as easily done as translation involving more exotic languages such as Hindi, Zulu or Yiddish. 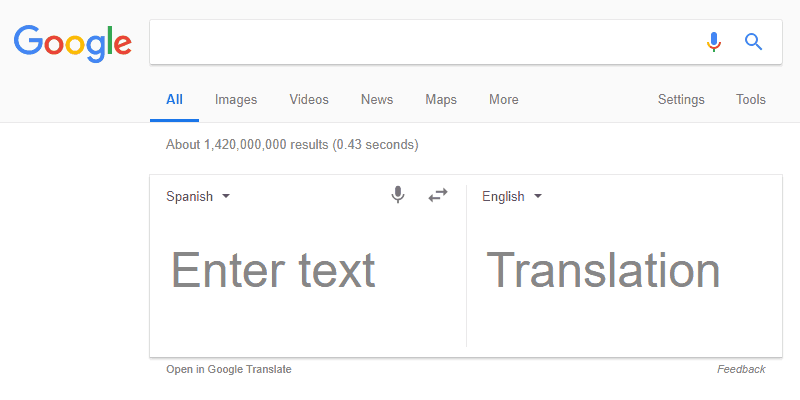 What should be mentioned here however, is that results using this translator usually include a few more suggestions than the other online references. We sometimes felt that the semantics suffered somewhat due to this large amount of search results. For you however, this means that you should pay keen attention when using the translator and when in doubt you should confirm words using another online dictionary. 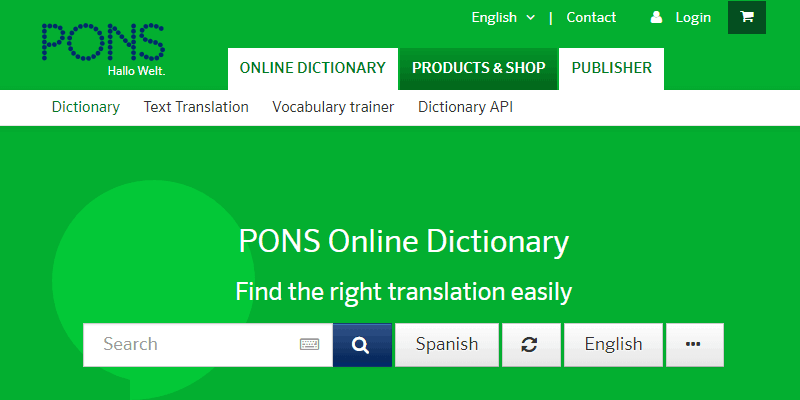 PONS offers you translations in 14 languages with an average of 1.63 million keywords per language. In addition, it provides a picture dictionary and a free vocabulary trainer with different levels of difficulty. As a user, it is also possible to add new vocabulary at PONS and introduce new words. These will be highlighted in brown until they have been confirmed by experts. Thus, users are actively helping to improve the dictionary. Spanish – English phrases can be translated here as well, though there is still room for improvement concering the grammar. Another notable feature is the youth dictionary to which you can add your own slang. PONS – a well-stocked, online dictionary that we’ve found to be reliable and trustworthy, and also updates weekly. In 2014, dict.cc was the most widely used online dictionary in German-speaking countries. That’s pretty impressive as in contrast to the above-mentioned online dictionaries, it is only fed by users. This however, does not mean that it offers us less competent results. In fact all entries are examined by the websites specialists. There areas many as 2,183,192 entries in 26 languages! Also provided is a forum and a vocabulary trainer that’s available for free usage. An otherwise rarely offered bonus is the technical term section. Here we get information about professional/technical terms that we would otherwise find with difficulty or in appropriate specialized dictionaries. dict.cc is one of the most remarkable representatives among online dictionaries. It has a great stock of words and covers specialized vocabulary. Founded in 1999, this portal is one of the oldest representatives of virtual dictionaries. With vocabulary for 17 different languages, it is also one of the most internationally used online dictionaries on the web. WordReference does especially well in translating Spanish. We were also impressed by the amount of examples and word information that were supplied with each search result – that feature is really awesome! If there are any questions, you will have the opportunity to contact the bustling community. Unique is the reading program of WordReference. It includes different features such as, various accents including British English, US English and Scottish! Thumbs up for an innovative, user-friendly webpage with an option to demand help. This is another online dictionary project that was created by students. It was founded at the Chemnitz University of Technology and was created in 1995, so it is even older than WordReference. BEOLINGUS possesses over 184.000 words in the following translation formats of German-Spanish, German-English and German-Portuguese. In addition, there are 383,000 definitions and synonyms as well as 3.919 million sample sentences. Two of its special features are 1) a converter for physical quantities and 2) a syllable separator for German terms. What we think: BEOLINGUS is a great dictionary that we highly recommend! Especially as it relates to the field of Portuguese, the dictionary does better than many collaborators. Lingros’ slogan – “The coolest dictionary known to hombre!” – made us curious. With a little more research, we learned that the founder, Artur, created it when he was reading “Harry Potter y la piedra filosofal” (“Harry Potter and the Philosopher’s Stone”). He was unhappy with the slow search results of other services and decided to do better. The main focus of the 11-lingual dictionary is to allow persons to have fun while learning. The 8 million translations and various educational games provided help us with that. A very special idea is the “Lingo Web Viewer ” – a mega cool tool, in which you simply paste the URL of any website. Then, whoosh, just like that, Lingro shows this site again, only this time, every single word is clickable. If you do click, an instant translation appears on the page. No copying or typing necessary. Brilliant! This online dictionary is at least as charming as its founders’ reason for building it! Simply unbeatable when travelling – Spanish Dictionary Apps! One brief glance at our smartphone and everybody will certainly find the right words. Even in everyday situations, they are fast and above all convenient assistance to us. Some dictionary apps translate spoken words and even whole sentences. Their output will be a text or the audio version, which is extremely practical! You are perfectly equipped when leaving the house. Here we took a very close look at 5 of the best apps available. Most of them work well with both Apple and Android devices. 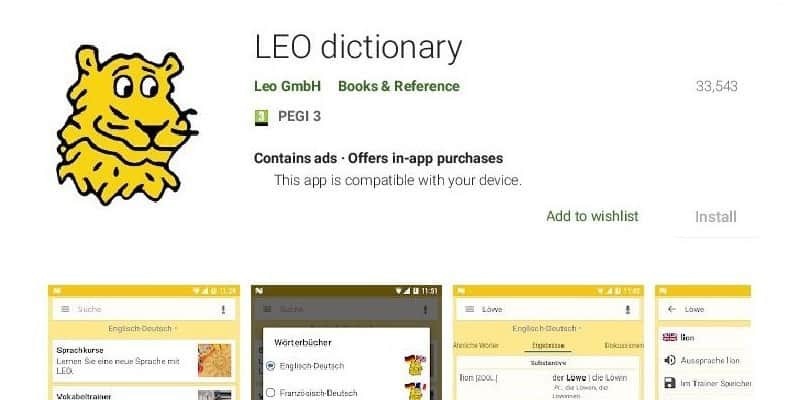 Find out now which dictionary app suits your needs the best! The Google Translate app, like its big brother the Google Translate, is more a translator than a dictionary. As before, we added it for sake of completeness as a lot of people are using it. This app is able to translate 80 languages in written and spoken form. Unlike the online dictionary however, the defaulted language will be detected automatically when activating the appropriate setting. This makes it quite enjoyable and easy to translate Spanish to English. A solid app! Particularly noteworthy is theavailability of a language pack which can be downloaded to your mobile phone. This solves the problem of offline research. In addition, you have the option of simply taking a photo of your text or even just holding your phone over the words and the app will then translate it instantly for you. Pretty awesome, right? LEO as an app has all functions of online dictionaries. Besides translations into 7 languages, it also offers us an offline vocabulary trainer as well as definitions and grammatical help for verbs. Unfortunately a connection with the internet is required to make it work. This free app is very nice and highly recommended. 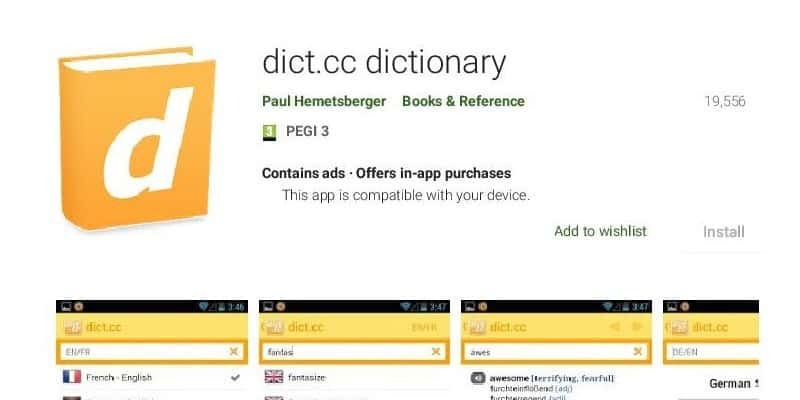 With 51 available language pairs, the dict.cc dictionary app is one of the largest. The required language can be downloaded as a small or large vocabulary package directly on your device. Offline usage also eliminates all annoying ads. Also, it has a great way of typing in query words: When starting dict.cc, you just select a language and then immediately type in the words. As this online dictionary is bidirectionally, it auto-selects the right translation direction. In addition, it suggests fitting words while typing and therefore speeds up the whole process. 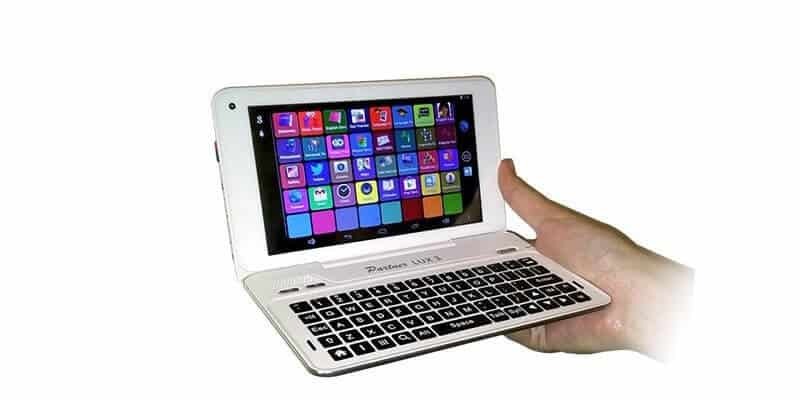 The only drawback is that you could lack the required storage capacity on your smartphone. Learning Spanish online and offline is fun with this simple, convenient and user friendly app. Also widely known is the app iTranslate. With 80 offered languages, it is even competition to Google Translate! As a user you will be supplied with suggested words while typing just like at dict.cc. However, spoken words are only understood using the paid premium version. In any case, you need an internet connection to make it work. Thus, there is no way of offline usage. 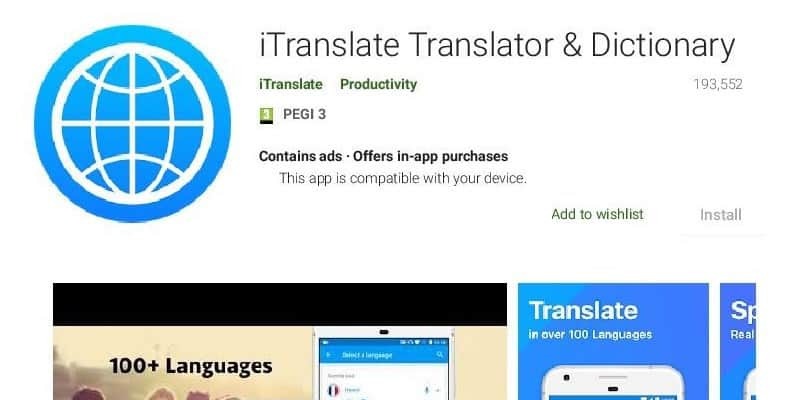 Due to its large vocabulary, this app is a hot tip for those of us who dislike Google Translate or want to avoid it. You will be in good hands! There are more than enough opportunities for you to learn Spanish with dictionaries. Whether traditionally by book, or more modern through the help of browsers and apps, everybody will find their match. Learning a new language is definitely worth the effort! Languages open the gate to new worlds – and learning Spanish is easier than you think! We dare you – get a dictionary that fits your needs, and start learning today! So, ¡vámonos! 365 queries in 2.987 seconds.